Last week in Plumbing Basics, Part 1 we covered the selection and use of hose, clamps, T-pieces and barbed fittings. This week we take a look at valves and pressure regulators – and they’re not just conventional automotive items! Ball valves are very widely used in industry. Inside they consist of a ball with a hole through the middle. The ball can be rotated by an external lever so the hole aligns itself with the entrance and exit of the valve or conversely, aligns itself at 90 degrees to the internal path. When the hole in the ball lines up with the entrance and exit, the valve is open. Obviously, when the ball is at 90 degrees, it’s shut. Ball valves are usually used in just the two positions – fully open or fully closed. That is, their major use is as shut-off valves. 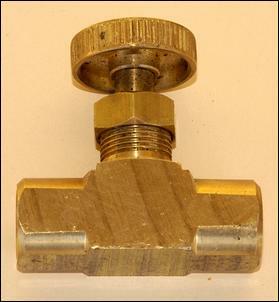 The angle of the handle normally reflects the open/close status of the valve – in this pic, the valve is closed. Industrial and pneumatics suppliers have ball valves available in a huge variety of sizes. 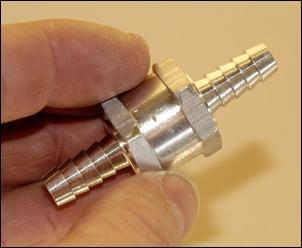 They are normally constructed of plated brass and require male threaded fittings to allow hoses to be attached. Plastic ball valves are also available but they should be avoided in automotive applications. Ball valves can be used to shut off the fuel system, turn off a water spray system or change a boost control setting. While they can be used in part-open positions (eg to act as a restrictor in a boost control or fuel system), when they are set like this the flow through them can vary non-linearly. This is because their internal design in part-open positions is not very streamlined – they can induce a lot of turbulence in whatever is passing through them. However, if the system operates happily with a ball valve being used in a part-open position, fine. Unlike ball valves, needle valves are specifically design to vary flow. They use an internal tapered needle that is wound in and out of a matching tapered seat. 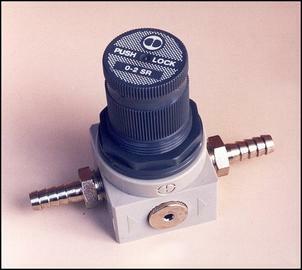 The number of turns to go from fully closed to fully open is set by the pitch of the thread used in the upper part of the valve; this characteristic can be specified when you buy the valve. It’s an important one because the precision with which you can set the valve varies a lot depending on whether the valve has (say) 6 or 15 turns. Like ball valves, needle valves are available in a very wide variety of sizes. Whatever the size, they are more expensive than a same-size ball valve. A needle valve gives great control over flow. For example, if you are setting-up the Independent Electronic Boost Control kit (see The Independent Electronic Boost Control, Part 1), a needle valve can be used to quickly and easily set the optimal size of the required bleed orifice. Similarly, a fully pneumatic boost control with a needle valve being used to regulate bleed flow allows the peak boost to be set with a lot of resolution. Whenever you want to be able to finely adjust flow, think ‘needle valve’. When buying valves, pressure regulators or solenoids, you must make sure the valve is appropriate in internal construction for the fluid you’ll be flowing. Pretty well any valve will be happy with clean filtered air passing through it (say in a boost control system), but if the valve is being used in a fuel system, it must be specified to cope with the presence of fuel at the designated pressure. Also, don’t assume that because the valve is made from a non-corroding material like brass, it will be suitable for water. Oftentimes, it isn’t! Again, when working with water, make sure you specify the fluid with which the valve will be working. Many people don’t realise it, but all solenoid valves are directional. That is, they may leak if connected the wrong way around and subjected to pressure. The correct orientation is often shown by an arrow marked on the body of the valve but if this is missing, the valve should be pressure tested at its working pressure – normally it will hold pressure on only one port. Most solenoid valves are two port – ie there is an entrance port and an exit port. These valves are called two-way. 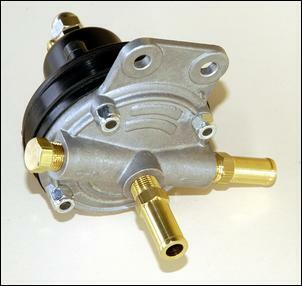 However, three-way valves are also common – many factory boost control valves are three-way. In these designs, the pressure port is switched from one outlet port to another outlet port when the valve is energised. Working out what ports do what is most easily done on the bench – a large syringe (available from chemists) is a good source of pressure. 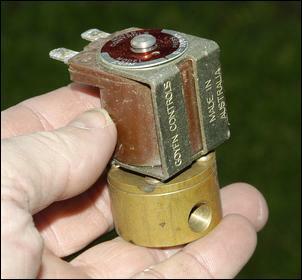 Industrial solenoids often have swappable coils. This is important because if you source a solenoid valve that is perfect for the application – but it has a 24 volt coil – it’s very likely that the coil will able to be changed for a 12V one. When continuously energised, solenoids can get very warm. They should always be mounted away from heat sources like exhaust manifolds, turbos and radiator air exits. If the solenoid doesn’t just get warm but is bloody hot, you may be able to put a high wattage resistor in series with it – for example, a 10 watt, 10 ohm ceramic resistor (available from electronics stores). This will transfer some of the heat generation from the solenoid to the resistor. However, make sure the solenoid still works effectively with the lower voltage at which it will be operating. 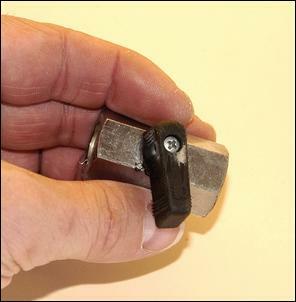 Some solenoids have an internal diode which makes them polarity conscious – ie, if you connect them the wrong way around, they won’t work. Therefore, if there’s a clear polarity indicated on the solenoid (eg by a ‘+’ marking), this should be observed. Solenoid valves available from wreckers include boost control valves and vacuum plumbing valves. Clearly, these are designed to be used only with air. From LPG conversion specialists you can buy fuel solenoids (used as shut-off valves in carby converted systems) and from industrial suppliers you can buy solenoid valves in any size and suitable for any fluid. Solenoids can be made variable in flow if they are pulsed with a variable duty cycle. This works especially effectively when it’s air that’s passing through the solenoid. See Performance Electronics, Part 2 for details on how to electronically achieve this. As their name suggests, one-way valves allow flow in only one direction. One-way valves vary in three main specs – their size, the fluid they’re happy working with, and their ‘cracking’ pressure. The latter refers to the point at which the valve will open when the fluid is flowing in the direction in which the valve allows flow. Small one-way valves suitable for air are available from wreckers – many cars have plastic valves mounted in-line in the hose going to the vacuum brake booster. These valves are usually happy working up to about 15 psi – some that are made of steel will go much higher. For higher pressures than this, or when fluids other than air need to be handled, head off again to the industrial suppliers. There you’ll find a very wide range of sizes, constructions and cracking pressures. One-way valves are cheap – if you find only expensive ones, the valves are probably designed for much heavier duty applications that you need. 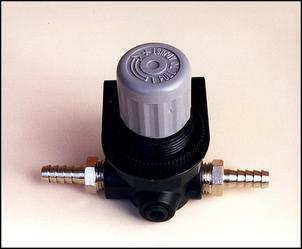 Pressure regulators are designed to either maintain the same outlet or inlet pressure, irrespective of flow. Most common in car applications are fuel pressure regulators, as fitted to the fuel rail (or in the fuel tank) of all EFI cars. These fuel pressure regs normally control the outlet flow – ie, they hold the pressure in the plumbing behind them. Most automotive fuel pressure regs mounted in the engine bay also have a manifold pressure connection, and keep the fuel pressure at a fixed headroom above manifold pressure (rather than above just atmospheric pressure). Factory fuel pressure regs are usually not adjustable while aftermarket fuel pressure regs (like the one pictured) are always adjustable. Another type of pressure regulator is available from industrial suppliers. These are most often designed for use on compressed air systems operating at up to 100 psi or so. However, when they are fitted with a softer internal spring, they can be used to regulate wastegate pressure in a boost control system. In this sort of application, the regulator controls the pressure on its outlet side, that is, between the pressure regulator and the wastegate. So that this pressure can drop when the inlet pressure to the regulator decreases, a self-relieving design of pressure reg is needed. Another valve designed for use in compressed air systems, but also able to be fitted with a softer internal spring that makes it suitable for use in boost control systems, is a pressure relief valve. A pressure relief valve prevents any airflow passing through it until the input pressure reaches a certain, adjustable, level. 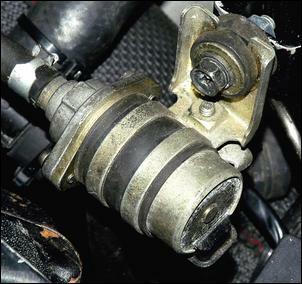 The use of one of these valves in a boost control system prevents boost getting to the wastegate until the cracking pressure of the valve has been reached. For more details on this type of boost control system, see The Audi's DIY Boost Control - Part 1. A pressure relief valve can also be used to limit pressure, bleeding it off when the cracking pressure has been reached. This allows the application of the valve to control boost pressure if the wastegate goes mad (a pressure relief valve was fitted as standard to the plenums of early turbo Nissans to perform this function) and other emergency relief functions. The control of flow and pressure can be achieved using any of a multitude of valves commonly available from wreckers and industrial suppliers. Using the right bits and pieces allows the construction of custom systems that perform reliably and don’t cost a lot of money.